The opening of Hacer Ciudad México 2015, the exhibition organised by SpazioFMGperl'Architettura in partnership with Academia Nacional de Arquitectura Capítulo Monterrey and with the participation of Versitalia, Archdaily and Floornature, was a great success. 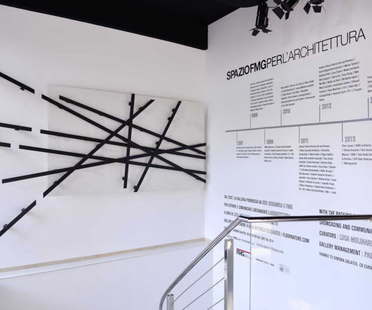 During Expo Milano 2015 the architecture and design studios of architects Franco Albini, Achille Castiglioni, Vico Magistretti and Piero Portaluppi offer Expo visitors an opportunity to experience the atmosphere of the places where icons of Italian architecture and design carried out their everyday work, made up of objects, spaces, curiosity and visions. On June 11 SpazioFMGperl'Architettura inaugurates the exhibition Hacer Ciudad México 2015, organised in partnership with Academia Nacional de Arquitectura Capítulo Monterrey with the participation of Versitalia, Archdaily and Floornature. French architecture firm, Atelier Zündel Cristea AZC is completing a residential-healthcare facility in Paris for the most vulnerable brackets of metropolitan society. One of the recipients of the 2015 Institute Honor Awards for Regional and Urban Design given by the American Institute of Architects (AIA) is Target Field Station, the light rail expansion project in Minneapolis, designed by New York-based Perkins Eastman. Hungarian firm Spora Architects has designed two stations on the M4 line in Budapest.